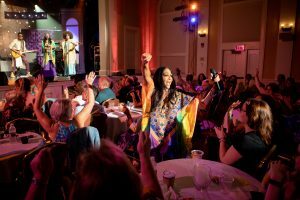 Sheila E Brings Her Message of Love to The Kate! What a special evening we were treated to when Sheila E brought down the house on Sunday night! She had the audience on their feet and at one point, in tears, as she asked us to share a hug with a stranger and to bring that love back out into the world with us. She brought the show to the crowd as she performed one song among the audience and invited a few lucky fans on stage to dance with her and her amazing band for another! Don’t worry if you didn’t catch the live show…Season 4 of The Kate will premiere in the Spring of 2019 and so will Sheila E’s episode!